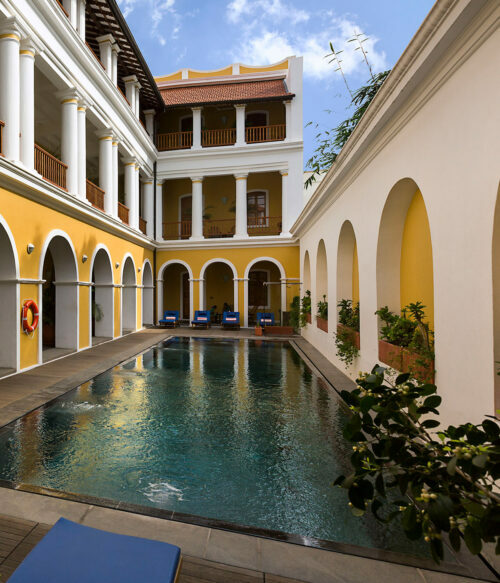 Palais de Mahé - A lovely edition to the CGH Earth family owned hotel group, Palais de Mahé is located just 50 metres away from the Bay of Bengal and offers a true taste of old French colonial Puducherry in this historic seaside town. 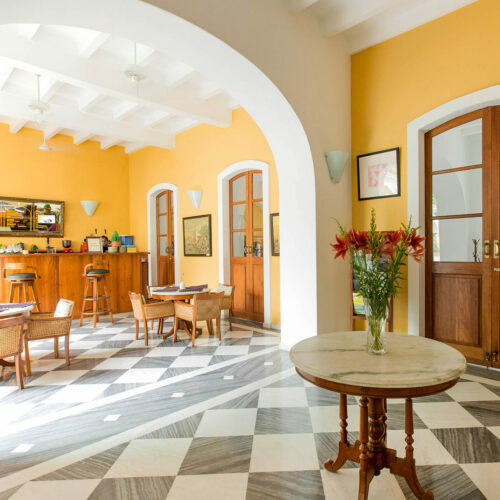 Considered one of the best addresses in town, Palais de Mahé is a pretty, mustard hued building with high ceilings, tiled floored, whitewashed walls, arched doorways and deep verandahs. Situated just a few steps away from the bustling picturesque promenade and villas of the French Quater, the hotel boasts an inviting swimming pool within the courtyard and 18 spacious rooms with verandas and period influenced interiors. Each room is well furnished with large free standing four poster beds, flat screen TV’s, air-conditioning and tea and coffee facilities. Return to the hotel after seeing the sights to enjoy the unique and enticing fusion of Indo-French cuisine, which is a speciality of the city. 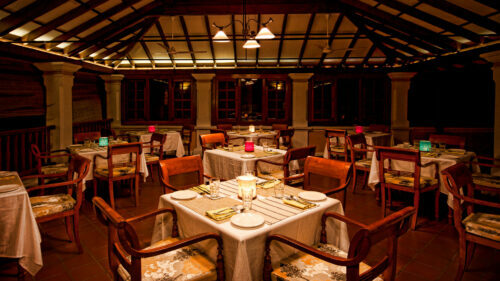 With is roof top location the restaurant, Les Alice provides a lovely cool breeze and sea views. The Hotel bar is open all day with a large menu of cocktails and mocktails to keep you replenished. There is a small spa offering the legendary CGH Earth Ayurveda treatments with resident doctors available for consultations and treatments. 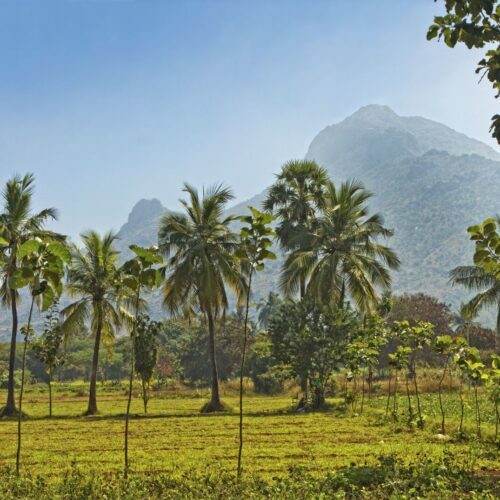 The hotel is also true to the CGH Earth ethos of sustainability, using regional materials and ensuring the hotel is energy efficient and products are as locally sourced as possible. 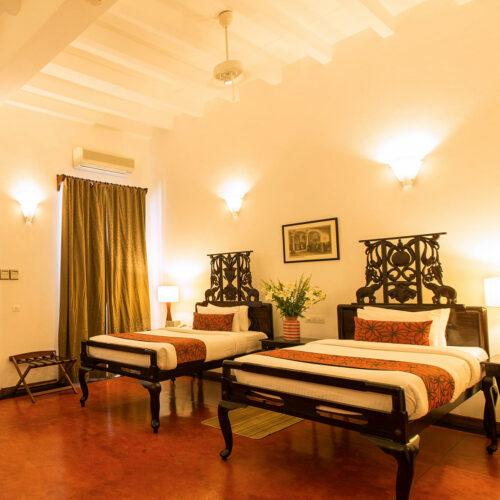 You can also see the art of local artists adorning the walls of the hotel, which are often leased out, allowing you take up a little piece of Pondi on your return. 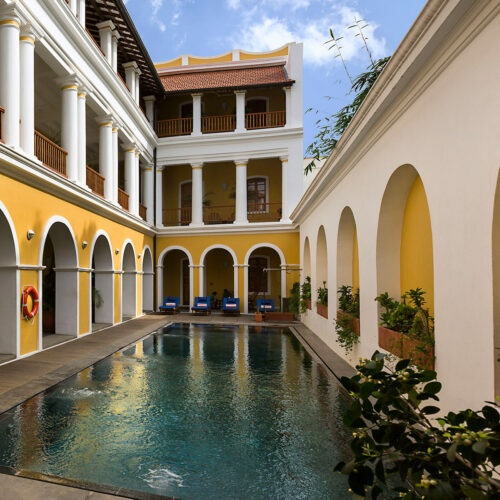 Visit the sister hotel of Maison Perumal in the Tamil Quarter for some more coastal Tamil cuisine and an insight into the wonderful contrasts of this fascinating city.